Today’s topic on TAT over at Growing Up Geeky is about Moms and dreams (I’m paraphrasing). I think this post is perfect timing for me; I had a little bit of a life breakdown last night and it’s all about my current situation. I’m living THE dream in all parts of my life except my job. And my husband will be quick to point out that I have a pretty awesome job… and it is… but it’s not making me happy. Instead it is “sucking the life out of me” as I love to say. It has it’s major perks: flexible time off, ability to occasionally work from home, off the week between Christmas and New Years, Friday’s off in the summer, occasional free concerts, good benefits. It also has it’s major downsides: uncompensated nights and weekends (life sucking schedule), weak management (this is a public blog or I might say something else), ALL women (= lots of behind the back-talk), terrible pay, uninspiring work load, 0 maternity leave/benefits, unfair employment standards, low employee satisfaction, you get the idea. So, as a way to improve my work life, I decided this would be a good time to start my own business. Six months ago I started Cherry Lane Designs. It’s a combination of my love for cross-stitch, and an outlet for my creativity. I want it desperately to be a full-time gig, but just like any start-up it takes time. It will also probably never be a very lucrative business, but it’s my dream. Here is the kicker: yesterday my worlds collided. My day job has a MAJOR confict with my dream job, and I am so disappointed about it that I cried for a long time last night. So far John and I have not been able to come up with a solution. The major conflict is in scheduling. The biggest part of my day job is to run a national music composition. It always happens the first weekend in March, so this year it is March 1-3, 2013. I just found out yesterday that the biggest and most important convention for the cross-stitch industry is that same weekend in Nashville. I was absolutely crushed. I cannot do both, and right now my day job is winning over my dream job, because frankly I make more money at the day job. Now, I feel like this is some sort of spiritual moment – a cross-roads in my life. Like God is trying to send me a sign, and answer my prayers. But the problem is that I am not brave enough (and let’s face it, I have a family I need to worry about) to just leave everything that is comfortable and jump into something that may or may not pan out. I mean, most of the cross-stitch designers that I know of all have other jobs. But their other jobs don’t stand in the way of their creativity. In my conversation/argument with John last night I said this: My dream is to stay at home with my babies and make a little cash selling cross-stitch designs. And that is absolutely 100% the truth. I know that I need to fight for it, that the road will be tough, and that I will suffer set-backs. I just never thought it would be so emotional! So TAT! When I grow up I want to be a work at home mom who owns a small business, attends PTA meetings, carts her kids around to baseball and music lessons, and attends yearly conferences in Nashville. Is that so much to ask? PS – I am being very brave by even posting this, so I guess that’s a step in the right direction. PSS – The thing about me is that I change my mind a lot, so ask me again in a few months and I may change my tune. One thing is for sure, I want to be “there” for Preston and any future siblings he may have. That will never change. Once the backyard birdies flew the coop, we needed a new project. On an unrelated trip to Joann Fabrics I discovered a jackpot of giant pots that were marked down to 60% off. Combined with a 10% off coupon I struck up quite a deal. I bought a $130 dollar pot for $45. I had one small problem. It had a drainage hole in it. So I also bought a small pack of crafting corks, and headed over to Lowe's for some Silicone sealant. When I got home (and John helped me unload the 50lb pot), I corked it and sealed it and filled it with 23 gallons of water! I let the water settle for a few days before I went shopping for plants. On Saturday morning the Things to do Family set out on a mission. They were in search of water plants! Without much thought they decided to go to their local home and garden center. No dice. Due to a shipment problem they were fresh out of water plants. A diaper change in the trunk later, they headed to another local home and garden center. This one was much further away, and, again, had no trace of water plants. Luckily, the Family has a secret weapon: a toddler. People love to give toddlers lollipops, and, as it seems, shopping advice. John struck up a conversation with a few other shoppers while Pres enjoyed a blue lollipop, and learned that THE place to go for water plants is... TILLEY'S. Who knew? Lickety split the Family was back on the road headed straight for Tilleys. JACKPOT! There were water plants as far as the eye could see! 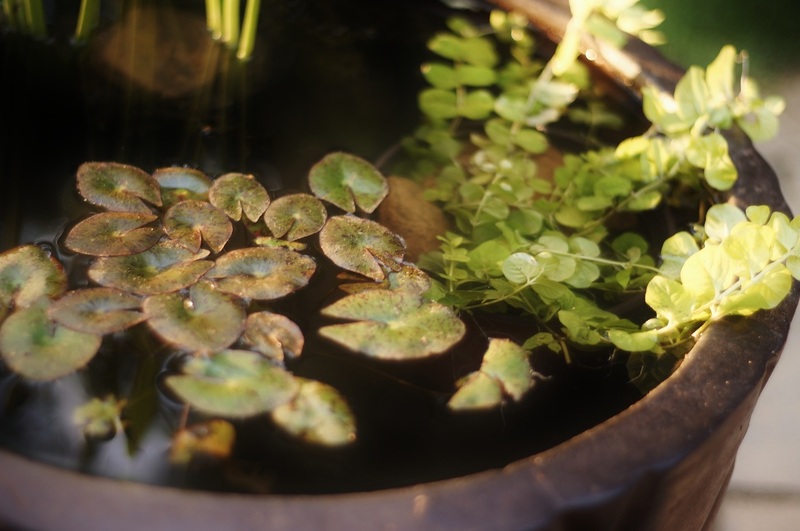 One Rush, One Lily Pad, and a few bundles of oxygenating weeds took them back another $50. They ate lunch and returned home for a late afternoon nap. As a finishing touch they bought 4 tiny fish for a total of $.65. 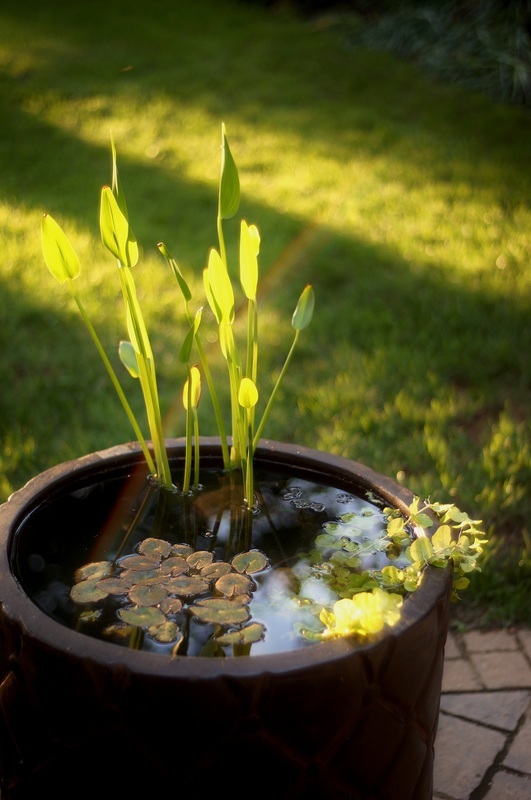 And the final result is tranquil, fun, container water garden (also known as Preston personal splashing place). A few days ago, as I was eating my cheerios in the morning, I noticed a robin flying in and out from under our patio roof-line. It was clear that she was building a nest. 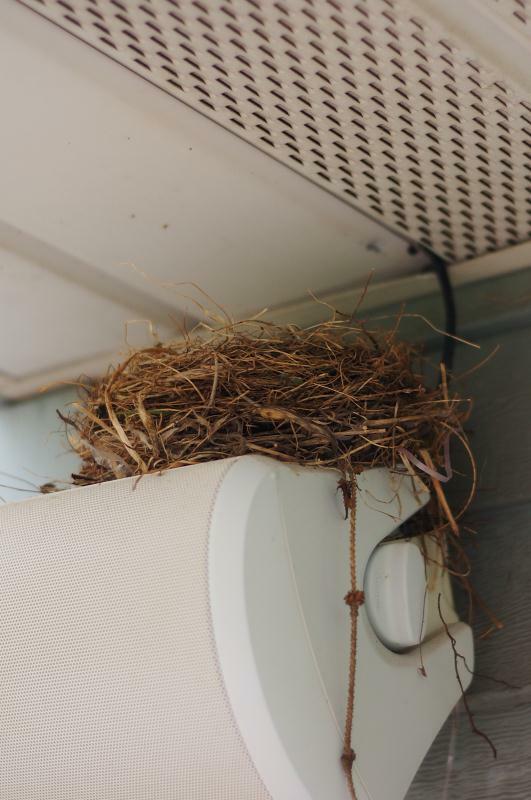 I mentioned it to John, and we decided we would let her be and remove the nest when all the babies fledged. On my way to work I had the brilliant idea that we should livestream the nest and post it here so everyone could enjoy our baby birds! 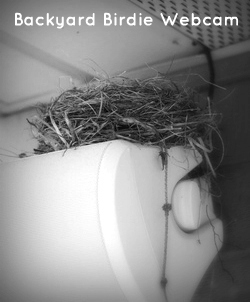 I pitched the idea to John who said "I may or may not have removed the nest this morning." I knew it (he would do something like that)! I was bummed, but I got over it. Well, what do you know? The robin wasn't entirely discouraged by the small nesting set-back, and over the last 2 days has build this beauty! Now, I need everyone to chime in and encourage my hubby to help me set up the webcam... he's not as excited about the idea as I am. We only have a few days to do it, too. According to my research a Robin lays an egg a day until she gets to 4. Then she roosts for 2 weeks, during which time we should not disturb her. Assuming she lays her first egg either today or tomorrow, we only have until Sunday or Monday to mount a camera.